The Lady Bulldog softball team was finally able to get a better bead on Roswell High ace Mykaya Olivas in their final District 4-AAAAA bout with the Lady Coyotes Friday at the Mack Chase Athletic Complex, but it was still no match for the hit parade staged by the girls in red. 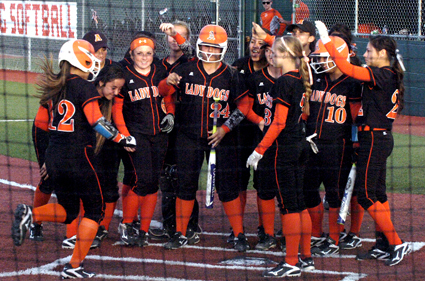 After falling to Roswell in a three-hitter in Game One, 4-0, Artesia logged eight runs on 10 hits – including a whopping four home runs – in the nightcap. But the Coyotes answered with 16 hits of their own against a trio of Lady ‘Dog pitchers to come out on top, 14-8. Artesia’s first tater of the night gave the squad a much-needed shot of confidence, as sophomore slugger Adrianna Baeza launched one over the center-field fence to give the Lady Bulldogs a 1-0 lead in the bottom of the first. That would have counted for much in the low-scoring affair that was Game One, but the Lady Coyotes quickly answered with four runs in the top of the second on a bases-loaded walk, an Adrianna Horton single, a RBI ground out, and a wild pitch. With Olivas holding Artesia at bay through the second and third innings, Roswell tacked on six insurance runs in the third and fourth to bump their lead to nine, 10-1. But the Lady Bulldogs had no intention of being run-ruled, battling back in the home half of four with a pair of two-RBI homers by Aubree Olguin and Madisyn Asbury. That cut the Coyotes’ lead in half, 10-5, but Roswell would plate two more in the top of the fifth. Elisa Cardenas led off with a solo homer in the bottom of the inning and Gracie Puentes delivered a RBI single to make it 12-7, and Artesia was able to pull within four, 12-8, in the sixth on a RBI line drive up the middle by Cardenas. Roswell High, however, would keep their lead comfortable with a two-RBI double by Alexis Acevedo in the seventh, and despite a two-out double by Puentes, the Lady ‘Dogs went scoreless in their final at-bat. Cardenas finished 3-4 at the plate on the game with a homer and two RBI, Puentes was 2-3 with a double and one run batted in, and Olguin went 2-4 with a homer and two RBI. The Lady Bulldogs had a tougher time at the plate in Game One Friday, managing just a trio of hits against Olivas. Roswell picked up the game’s first run in the third on a solo homer by Nayelli Morales, and Artesia had a chance to tie in the bottom of the sixth. Back-to-back singles by Alexa Riggs and Baeza gave the home team a runner in scoring position with two away, but a strikeout ended the threat. The Coyotes, meanwhile, added three in the top of the seventh on a two-run homer by Olivas and a Morales RBI single to set the final, 4-0. Olivas struck out 13 and walked none in the win and brought her K total on the night to 24 with 11 more in Game Two. Lady ‘Dog sophomore Kacey Thurman had a solid night of her own in the opener, giving up seven hits – five of those coming in Roswell’s final at-bat – and striking out seven. Baeza went 2-3 at the plate and Riggs 1-3. 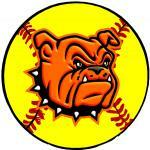 With the pair of losses, the Lady Bulldogs dropped to 11-11 on the year, 3-5 in district play. They’ll have a chance to put that mark back on the plus side this week, starting with a road trip to Goddard Tuesday for a 5 and 7 p.m. double header, followed by a 5 and 7 p.m. double dip Friday versus Lovington at The Mack.